With this Korean tour we explore both the west and the east of the country, its beautiful scenery, and visiting cities with a rich heritage, discovering many UNESCO World Heritage sites along the way. We'll also experience the natural beauty of Korea's most well known mountain, Mount Seorak. Upon your arrival at Incheon international airport, you will be welcomed by your driver, and transfered to to your hotel. The rest of the day is for you to relax at leisure. 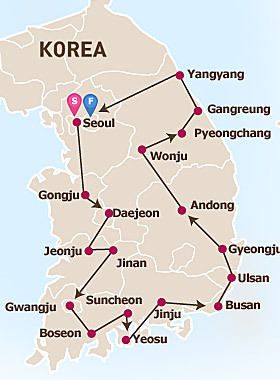 Today, after breakfast, you will enjoy a full day touring the highlights of Seoul. These include the Changing of the Royal Guard Ceremony at Gyeongbokgung Palace (Deoksugung Palace on Tuesdays), the National Folk Museum, Myeongdong's shopping district and markets, North Seoul Tower, and a drive past the Presidential Blue House. Today your tour guide will meet you at your hotel after breakfast, when you'll leave for Gongju. At Gongju you'll see the Gongsanseong Fortress, a mountain castle which was established during the Baekje Period. You'll then experience a tea ceremony condusted by a Buddhist monk at Magoksa Temple, a structure surrounded by mountains and rivers in Chungcheongnam-do Province. After dinner, we check in to our hotel and the rest of the day is yours to relax at leisure. After breakfast, we leave for Jeonju, first visiting Jeonju's Hanok Village, which has over 800 traditional Korean houses. After a Jeonju Bibimbab lunch in a local restaurant we visit the Tapsa Temple in Jinan. This is famous for having over 80 stone pagodas built by Lee Gapyong, a noted scholar. We then leave for Gwangju, and, on arrival check in to our hotel. Today, having had breakfast, we drive to the beautiful Boseong Green Tea Plantation - a region distinguished by its green tea fields and cedar trees. Moving on, we visit Naganeupseong Folk Village where we view the houses that are indigenous to this south provincial area. We also visit Suncheonman Bay Ecological Park, an area thickly strewn with man-sized reeds. Next, we stop by Yongsan Observatory and enjoy the views of the bay. Our final stop is at Suncheonman Bay Eco-Museum, which was established to provide a researc facility to preserve the natural habitats of the area. Following dinner, we check in to our hotel and relax for the evening. On day 6, after breakfast, we take a ferry to Odongdo Island. Here, a walk along the the breakwater allows us to enjoy the sight of up to 70 species of wild flowers. Next is a visit to Jinjuseong Fortress - historically linked to a Japanese invasion which occured in 1592. We head on to Busan and visit Nurimaru APEC House - a place where world leaders once gathered for an APEC meeting. We also visit the Centum City Shopping Mall, Korea's most pretigeous shopping destination. After dinner, it's time to check in to our hotel and rest for the night. After breakfast today we visit Ulgi Park, distinguished by rocks which have been eroded into interesting shapes by the natural elements of wind and sea. We then head to Bulguksa Temple, a site in Gyeongju designated as a World Cultural Asset by UNESCO. Moving on we visit Gyeongju National Museum, Tumuli Park and Anapji Pond. After checking in to our hotel, we enjoy dinner at a local restaurant. This morning, after breakfast, we visit Andong Hahoe Village, which is home to the descendants of the Ryu clan of Pungsan. It is a village famous for its traditional houses. We next visit Hanji Theme Park where you will have the opportunity to experience the Hanji (Korean paper) making process. Travelling on we arrive at Pyeongchang and check in to our hotel. Lunch and dinner today is served at local restaurants along the way. The evening is yours to spend at leisure. After breakfast, we will visit the Jumunjin Seafood Market, where we'll find a variety of fresh seafood which has been harvested from the sea along the East Coast. Our next stop is at Yangyang, where we enjoy and experience the natural beauty of Mount Seorak by taking a short hike. Having completed our hike, we return to Seoul, and after checking in to our hotel, enjoy the rest of the evening free at leisure. US$ 2040 per person- based on 2 sharing a room and airport transfers.